Hey everyone! This week marks two years of blogging for me. I first started blogging two years ago on August 10, 2011. You can find that post here (it's weird for me to read that post!). When I first started my blog, I'm not going to lie, I was a complete mess. I probably did everything on a “bad blogger” list and then some more. I quickly became addicted, and have made tons of awesome friends. The list could go on and on about how many bloggers I love. 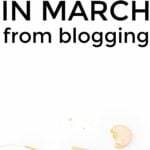 There are so many bloggers that I would love to list right now, but I tried that and the list had well over 50 blogs and just looked crazy. In the past 2 years, my life has changed drastically. Back in August of 2011, I was working full-time in the same job I have now, I was a full-time Finance MBA student, and we didn't have much money. I had tons of student loan debt also. We spent lots of money on things that we did not need. We were not saving. We ate out every single day, and most of the time multiples times each day. We did not have a budget. More personal: the passing of my father and the many family issues I was going through were tearing me apart. I had to start raising my sister and I was not ready. Everything, even 3 years later after he passed, was still reminding me of my father and I would break down everywhere I went. And that's when I started to blog. It was a great outlet for me, and still is. Things are getting better, and are great in the financial area. In my personal life, W and I have been together for over 7 years, and we couldn't be better. My sister is like my child now (oh hey Lexy!) and it has been awesome watching her grow into an awesome young lady. I have begun talking to my dad's side of the family, even though it is difficult as I am sure that I am a sad reminder. We never thought that our lives would be like the way they are today. We have also come to realize that we can't let money dictate our lives, and that we need to enjoy the little things. I also plan on pursuing what I love instead of stability, which brings great risks but also much more excitement and happiness. I never thought that my student loans would be gone, and especially not so soon. << STILL shocks me. 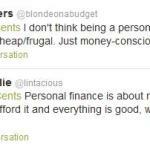 Blogging and personal finance blogging drastically changed my life, and for the better. I definitely recommend that others should start their own blog as well. For almost my entire blogging journey, I was anonymous. Not entirely anonymous though. But, as of a couple of months ago, the cat is out of the bag. W told a couple of people and then EVERYONE started to have questions, so now I am no longer anonymous. It has been different, and it is still a little scary since I feel like I have no privacy now. Oh well though, I am fine with being a more open person. Without all of you awesome bloggers and readers, I don't know where I would be. I receive numerous emails everyday, that range widely in topics. Many of you have emailed me about family issues, such as losing a parent(s) and your life changing dramatically. I really appreciate these emails and it helps make me stronger. Some of you email me with questions, such as about student loans or fixing your budget. I love all the emails that I receive. I love receiving emails, comments, tweets and so on. Who doesn't? I love getting feedback from you all. I love publishing Reader Question posts. I love talking about whatever I want to on my blog. I love it all! I want to thank all of you for reading. I hope that you continue to enjoy what I write for years and years to come. Also, I published a new post on What Not To Do When Leaving Your Job and I provided some real life examples of how some people are crazy when they quit. Check it out and tell me your craziest story! Diversified Finances has been going great, and I'm really glad that I started a second blog for myself to detail my switch to pursuing my passion. Lastly, before we get to the big giveaway, SwagBucks during the month of August is offering any referral of mine (old or new) that earns at least 50 Swag Bucks in total from any combination of Shop, Search, Watch, Play Answer or Discover (all the different ways to earn SBs) to be automatically entered into a drawing for a $50 gift card from the SwagBucks' Rewards Store. Here's a sign-up code for those of you who might be new to SwagBucks, for anyone that hasn't signed up but wants to be part of the giveaway: MAKINGSENSE70 — will give anyone who signs up 70 SB instantly when they redeem this code upon registration. Make sure when you sign up, you click on the text “I have a sign up code” (it can be small and hard to see, but definitely look for it) to put in the code. It's live now through Aug 31st. 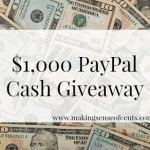 This $50 gift card giveaway is ONLY available to Making Sense of Cents readers who click on my referral link as that's how the lovely people at SwagBucks are tracking the entries. Thanks SwagBucks! It was also My Money Design's 2 year Blogiversary the other day as well, so give MMD some love! – If the winner of the iPad Mini prefers cash, then cash value for the iPad will be given instead. Hey Congratulations…. I didn’t be able to tweet or foloow on twitter as i have no account there but i have done on Fb…. I would keep the mini iPad if I won it, because I would love to have one. Great to see the progress over this time, and congratulations on the anniversary! The repayment of the student loan is a great achievement. Let’s see what you can achieve over the next year…! Good luck. Thank you so much for the chance to enter this giveaway. It would sure get me a head start on Christmas if I won. I would pay a bill. Congrats on your anniversary. Hello, if I were to win the iPad Mini it would become my new light weight companion and my husband can have my much heavier first generation iPad. Thanks for a great giveaway! Id love to win, to have something amazing to record my babys milestones! If I won the iPad I would give it to my husband for Christmas. 🙂 If I won the money I would use it to pay off some debt. thanks for the chance! if i won the IPAD, I would give it to my niece coz he loves playing in the ipad, i f i won the money, i would buy lots of food! My best advice is cut up the credit cards and pay in cash. 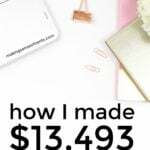 My number one financial tip is Couponing! I even have my hubby cutting them. We save thousands yearly! Happy anniversary! Great giveaway! i enter quite a few contests but never seem to win anything, however, i enjoy finding new blogs that are intelligent and fun, too. kudo’s on your 2nd anniversary! The money would help out with some bills. Don’t try to live above your means. A lot of people are pressured into buying the latest car so they can keep up appearances. While this may have its place in certain applications, I don’t feel it is a good use of resources. Common sense dictates you should not spend money you don’t have,but with the number of credit cards and payment plans available, it’s no wonder debt is so rampant. Don’t succumb to peer pressure into spending money you don’t have; live modestly, frugally, and sensibly, and Benjamin Franklin will smile from beyond the grave. I would love to win the iPad. I started a small, home based business two years ago & have no electronic devices to take with me “on the go”. So when I’m away from home overnight, it is almost impossible to catch up when I get back to a computer. If I win the cash, it will go towards an iPad. Two years! Wohoooo! 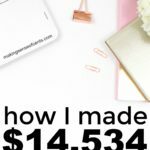 🙂 I’ve been reading your blog for the last 6 months and am always astonished at your monthly income reports, they never cease to motivate me! If I won the iPad I would definitely gift it to my Dad, who has been wanting one for a very long time. If I won the money I would be putting it toward our London trip next year! if I win the ‘ipad’ the would use for school. if I win cash would pay the hospital bill. les aconsejo que usen su dinero en cosas que en verdad necesiten. si yo gano el “ipad” la usaria para la escuela. si yo gano dinero en efectivo pagaria el recibo del hospital. What a giveaway!!! So exciting. My financial tip is, if you don’t have the cash to spend, why window shop? FOR ME – it’s just setting myself up for failure! I would love to win the iPad, but if I won money… after tithe 1/4 would be for me and 3/4 would go toward an extra student loan payment (or two!). Congratulations on your anniversary. Thank you for the contest. Financial tip: Save money for a rainy day. You never know what tomorrow will bring. Would really love the iPad… so many uses for it. I would save the money towards my sons’ college fund. Thanks for the opportunity!